I’ve always daydreamed about being a professional musician. Sure, having fame and wealth would be nice, but what really drives me is the chance to spend some quality time with some high-end audio equipment. Our review unit today isn’t high-end by any stretch of the imagination, but it does look pretty legitimate. 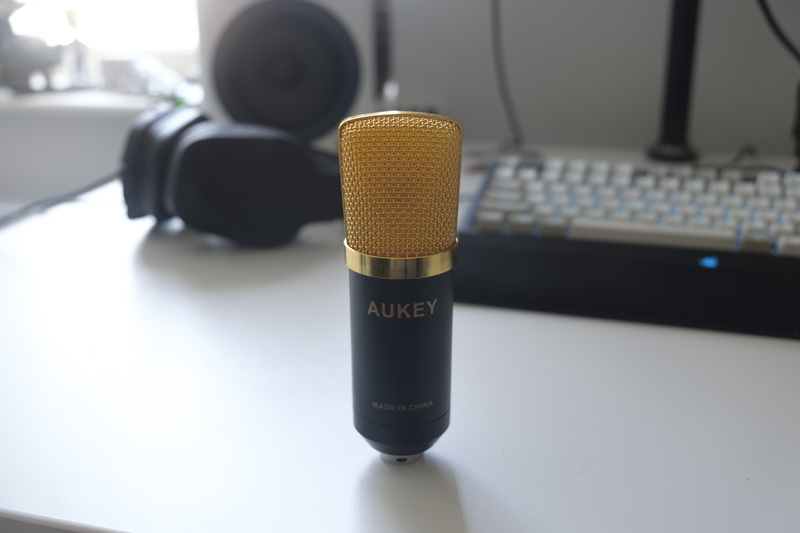 It’s the Aukey GD-G1 Condenser Microphone. In one box, you get a golden microphone (! 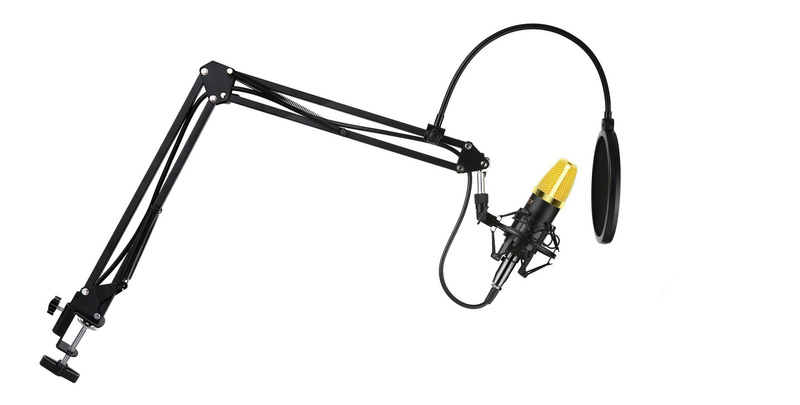 ), a pop filter, a shock mount and a boom arm — not bad for less than thirty quid on Amazon. Let’s see whether it’ll / feed my audiophile fantasy / or be a rough return to reality / in our rapid fire review. Given our remarkable lack of musicianship, we’ll be testing the Aukey GC-G1 from the perspective of content producers and Twitch streamers. We want to know how good the microphone itself is at capturing the spoken (and screamed) word, and how convenient the full studio setup is compared to a traditional headset or a desk stand microphone. The GC-G1 certainly provides a noticeable step up in terms of audio quality against the average headset microphone from the likes of Mionix, Logitech or Fnatic. Our captured vocals were rich and full of detail, with minimal noise from PC fans in the background. 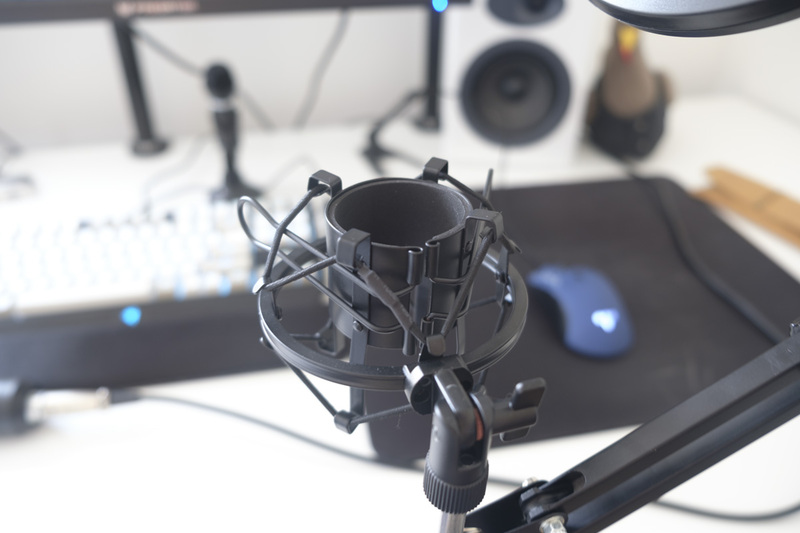 The pop filter was annoying to position (more on that later), but did provide reasonable protection from the popping p’s and terrible t’s that can sometimes ruin recordings. Even when we started shouting after getting shot in the back in Player Unknown’s Battlegrounds, we were still heard and understood by our teammates… not that they did anything to help, the uncaring so-and-so’s! However, getting good sound does require that your on-board sound card is up to snuff. 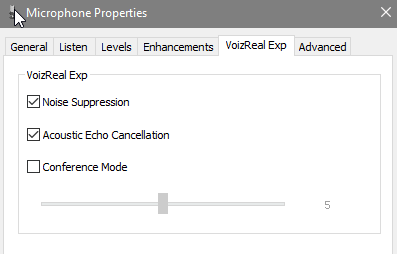 On some computers, we found that we got an unpleasant static in the background, which was only partly ameliorated by noise suppression options in our Realtek soundcard. If you are relying on low end components anywhere in the audio chain, you may do better with a USB microphone that provides its own sound card. If your setup is up to snuff though, then the GC-G1 outperforms its asking price and should serve as an excellent microphone for beginners. However, professional streamers or recording artists will likely budget for a higher-grade alternative from a vendor like Blue Microphones. The GC-G1 also impressed in its convenience and usability. The initial setup does take perhaps five or ten minutes to complete, but once in position we found that the boom arm was strong and stable, keeping the microphone exactly where we left it even when nearly fully extended (around 3 feet). 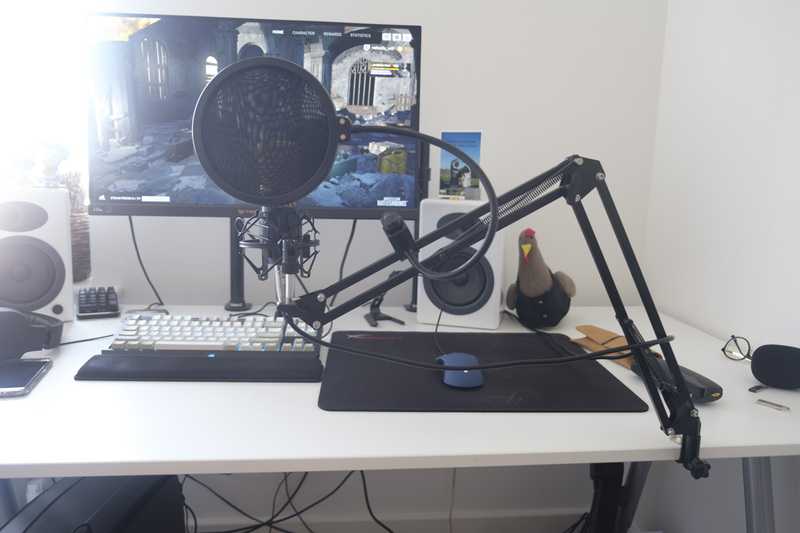 Being able to move the microphone into position for recording or streaming, then push it away to the side of the desk when finished was excellent, and was just as convenient as using a stand microphone with the added benefit of not taking up any (nearby) desk real estate. 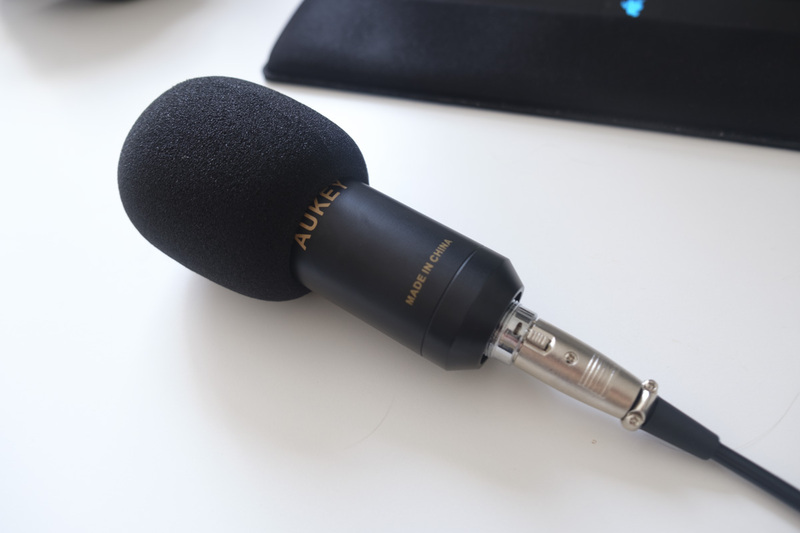 If you need to use a microphone for hours when playing games or podcasting but you also like to use your PC for other things, you’ll appreciate that flexibility. 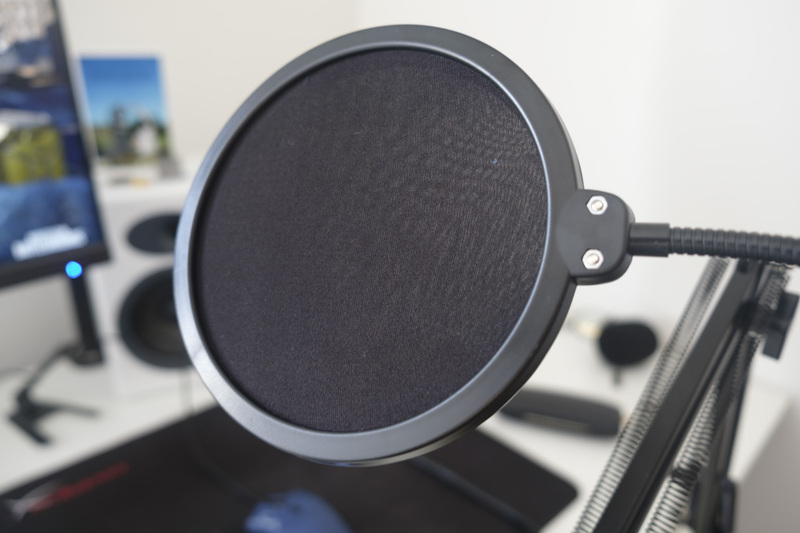 The pop filter was more finicky to position, with a tendency to lose rigidity and slump down if your initial positioning wasn’t ideal. We ultimately ditched the filter in the latter stages of our testing, and didn’t notice any massive issues in our amateur voice recordings and game streaming, although home studio users will no doubt have to contend with this minor flaw. The GC-G1 exceeded our expectations, providing a full studio-style setup with reasonable audio quality and excellent usability at a bargain basement price. 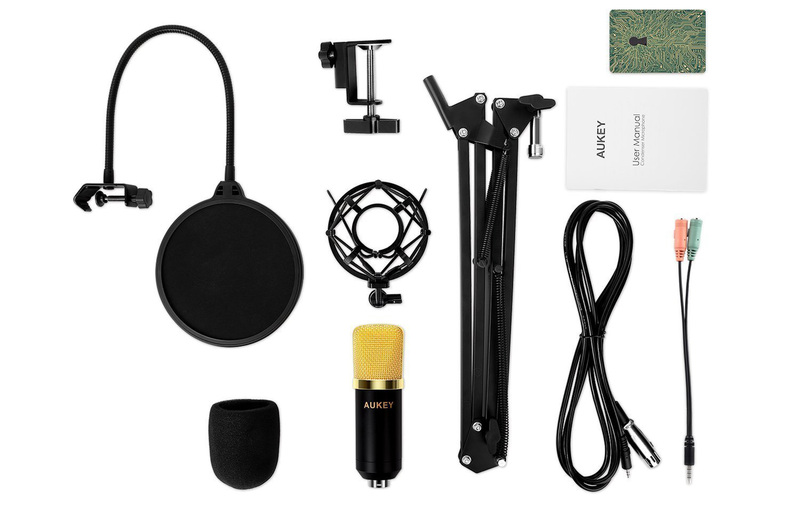 Professionals of all stripes should look at higher tiers of microphones, but interested amateurs would do well to consider Aukey’s £28 condenser mic kit.